4WD Hardware. How To Prepair Your 4 Wheel Drive for the big trips. Before travelling remote or going on a long trip, servicing the 4x4 is a MUST!! While getting the 4x4 serviced, if anything looks a bit worn and will require attention in the future, it would be wise to replace now before you embark on a remote trip, not doing so is asking for trouble, the same goes for anyone joining your expedition. If one companion doesn't get his vehicle checked and serviced before a trip it could spoil the entire trip for other travel companions. There is be nothing worse than towing someone else's vehicle back to town, which could be 100's of kms away, especially if it was due to something easily avoided if a service had be done prior to the trip. There is of course always the possibility of something breaking down (even after a service), but it will be less likely. 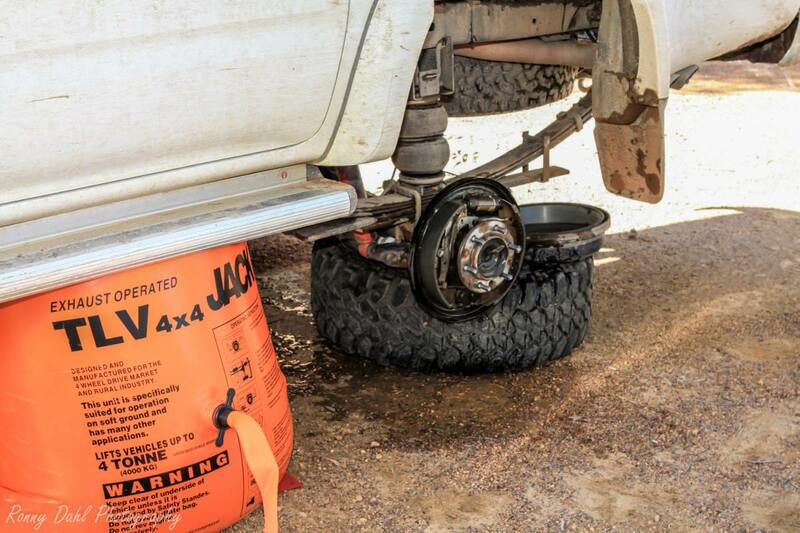 Prevention is always the best course of action on the 4WD hardware. I personally wouldn't recommend travelling solo in a remote area unless you have very good survival skill and that rules most city people out. Travelling solo will mean being 110% self-sufficient, carrying spare parts for the vehicle in case of something going wrong. Travelling in a group (2+ vehicles) still means everyone needs to be self-sufficient however you will have help and extra parts, fluids, tools and water if needed. It would be unlikely that both vehicles would require repairs. 4WD hardware, Spare parts include. Nuts & bolts (a good mixture including wheel nuts), radiator hoses (all of), a spare CV joint, fuel line, spark plugs, spark leads and fan belt, just to name a few. The list can get very long if you start adding a fuel pump, alternator, etc. Best way to narrow it down is to get a mechanical inspection done (during a vehicle service) and from there assess which parts are most likely to cause problems. 4WD hardware, Spare Vehicle Fluids include. Engine oil, coolant, brake fluid, power steering fluid, diff oil (both front and rear as some carry different types from front to rear), WD40 (for the electrics and loosening seized metal), distilled water (for batteries) & extra fuel. If two vehicles are diesel or petrol, one could carry the oil and the other coolant. This will help cut down on space and weight. I wouldn't recommend any less than 5 L between two vehicles, so if a third 4x4 is coming along it would be safer to carry another 5 L.
Example: 5 4WDs plan a trip, 3 are diesel and 2 are petrol. 2 petrol 4WDs will carry 5 litres of engine oil and coolant between them as both vehicles are using the same grade oil and coolant. To fit all these spare parts, fill up on fluids and repairs will require TOOLS!! Every vehicle will have a tire iron and a standard jack this is part of any 4wd hardware, but this will only allow a tire to be changed and that's if it's done road side as a standard jack won't work off road in most situations. There are many different types of tools as well, so what would you need? It's not too hard to narrow it down; the entire tool shed/box won't be required. Take electrical tools as an example, a wire stripper is not a requirement and neither is a soldering iron. A pair of wire cutters and electrical tape can get you home. With spanners you don't need to bring the entire set just the smaller ring spanners, the bigger nuts and bolts can be twisted with a pair of adjustable spanners. If you have the space an off road tool kit could be made bigger to make track side repairs easier to fix. All you need to make sure of is that every job/repair (within reason) can be achieved. Adjustable spanners 1 big 1 small, small set of ring spanners (the most common used), 3/8 socket set , small hammer, rubber hammer, screw driver set, a few clamps, small hack saw, wire cutters, electrical tape, duct tape, Tarp (to lay on), zip ties, tyre repair kit, roll of wire, torches, tie down straps (great for holding heavy/forceful things together, jump start cables and a long handle shovel. With these tools most repairs will be possible. A good selection on nuts and bolts (have helped companions and strangers out with these), wheel valve caps and cores, spare hose for compressor, wheel nuts and light globes. Brake fluid, power steering fluid, diff oil, WD40 & spare washer fluid soup. A full 1/2 & 3/8 socket set, 8 mm-17 mm ring spanner set, 2 adjustable spanners 1 big 1 small, wire cutters, long nose pliers, hammer, rubber head hammer, full screw driver set, 3 torches, nippers, strong tie wire, zip ties, 4 clamps, tie down straps, tire repair kit, tire lever, high lift jack (kangaroo jack), jump start cables, hack saw and a garden saw. The tires are an important part of any trip, having just one spare won't be enough on remote travel, carrying 2 spares is a must. If planning a big trip into a remote area it really pays to have a good amount of tread left on the tires including the spares. if any less than 75% tread left I would highly recommend getting a new set, there is a big difference between 75% - 95% of tread. If requiring a new set of tires make sure you get the correct tread pattern for the terrain that will be encountered during the trip. I personally think the mud terrain tyre is the strongest tyre one can get; a less aggressive tyre may just not be enough in some areas. Checking and maintenance while travelling. After long drives through the bush or outback it’s a good idea to check over the vehicle when stopping for the day. Checking for signs of damage, unusual wear, CV boots (on an IFS vehicle, these can tear easily), oil leaks, tires, oil level and coolant/antifreeze levels. Check the air filter and tap any loose dust out of it, unless you were driving the lead vehicle expect a fair amount of dust to be present. The next morning before continuing the trip check the vehicle again, if there was a leak overnight it should clearly be visibly on the ground. Checking the oil and coolant levels again will indicate if anything has slowly leaked overnight. Vehicle fires usually start from either the engines fuel system, excessive heat in the engine bay or from long dried grass getting stuck under the 4x4 near an exhaust pipe or other hot surface. Getting the 4WD regular services should prevent engine and fuel problems. Driving through overgrown tracks can pose a few risks, especially if the overgrowth is dry dead grass. Stop to check underneath the vehicle now and then if the track is densely overgrown. When stopping/parking a 4x4 try not to park above long dry grass or any other dry vegetation that could reach the underside of the 4 wheel drive. Everyone should have a fire extinguisher as part of their 4WD hardware and this should be placed so it's easily accessible. If your fire fire extinguisher is buried underneath all the camping gear you may as well not have one. Fires in Australia start very easily and burn faster than most people could imagine. Have an extinguisher in an easy accessible place will give you a fighting chance. Leave 4WD Hardware And Go 4 Wheeling In Western Australia.